Since 1977 Pflow has been the industry leader, offering complete vertical lifting solutions for mezzanines, balconies, through-floor, interior and exterior applications. 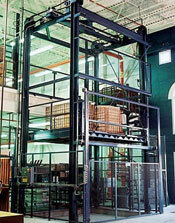 We have over 12,000 proven vertical lift installations all over the world in a variety of industries. Whether it's with a simple, two level vertical lift or a multi-level, multi-directional lift system, Pflow moves materials of all shapes, sizes, and weights. Floor-to-floor lifts are a self-contained dock lift that sits on top of the concrete. Just plug it in and you're ready to start loading or unloading any truck that arrives at your facility. This dock will service any height truck as well as provide dock to ground access as if you had a raised concrete dock. Vertical Reciprocating Conveyors (VRC's) move materials in factories, warehouses, industrial plants, institutions or anywhere that products or supplies need to move from one level to another. 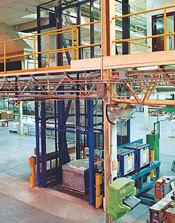 Vertical Reciprocating Conveyors are not elevators. In fact, they have their own national code (ANSI/ASME B20.1) and are specifically exempt from the national elevator code. Vertical reciprocating conveyors provide fast, efficient, convenient and safe access to/from mezzanines, balconies, basements, and between levels in multiple story buildings. They can be installed for through-floor, interior or exterior applications. VRC's provide a safe, efficient and convenient means of moving materials vertically from one level to another. They are safer than using a forklift to move materials between levels and equipped with advanced safety features to protect men and materials. Turnkey installation options are available or VRC's are customized to your application needs. VRC's are installed in existing buildings, unused elevator shafts or new builds. Designed for mezzanines, through-floor and other multi-level applications, there are several options to meet your needs. 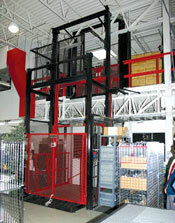 VRC's are less costly to install, operate and maintain than elevators. Meet or exceed ANSI B20.1 and OSHA regulations. Guaranteed code approval in every state.